Förbered er inför ett fantastiskt hardstyle event med dessa stora DJs! Efter den magiska kvällen tillsammans med Headhunterz & Coone är Your Thing! 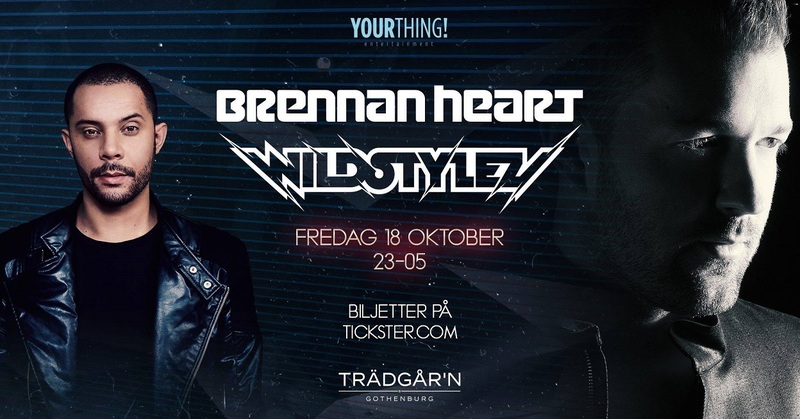 tillbaka med två tungviktare inom hardstyle fredagen den 18 oktober – Vi presenterar stolt BRENNAN HEART & WILDSTYLEZ! EARLY BIRD BILJETTERNA SLÄPPS PÅ MÅNDAG 25/3 KLOCKAN 12.00! OBS: ENDAST FÖRKÖP DENNA KVÄLL! As a representative of Dutch dance industry, Brennan Heart is one of the leading brands in international hardstyle music. Tracks like ’Imaginary’ and ’Lose my Mind’ contain his remarkable signature: harmonious melodies, catchy vocal lines and an impeccable production. ’Lose my Mind’ was an instant hit on YouTube with over 13 million views, which is an outstanding number for a hardstyle track. In 2013, Brennan Heart released a 50-minute documentary: ’Evolution of Style – a journey with Brennan Heart’, the first longplay documentary on this epic genre. It confirmed his status as a top-50 DJ in the DJ Mag top 100, as well as his leading status in hardstyle music. Born in 1983 in the small village of Veendendaal, Joram Metekohy – the artist best known as Wildstylez – discovered Hardstyle in the early Noughties, an energetic, fraternizing genre that can be found in many different guises. Perhaps it’s the different bands he has performed in or just his preference for songs with vocals –but Wildstylez has worked tirelessly to turn the genre on its head and create his own distinctive brand.